The verdict is in: The hong-eo experience warrants a hung jury. At first I thought it made no sense to eat hong-eo [fermented skate fish], a food that smells like ammonia because its uric acid — urine — has to pass through and is ultimately stored in its flesh. The adage, “Only in Korea ...” came to mind. Further investigation brought me to two of Jeju’s best hong-eo restaurants within a three-night span. On a routine Tuesday I went to Exhibit A, Donggwang Hong-eo in Shin Jeju, with a Canadian comrade. Thursday’s Exhibit B occurred with a Korean friend at Donam Buchon Sikdang, a few minutes from City Hall. Exhibit A was special. 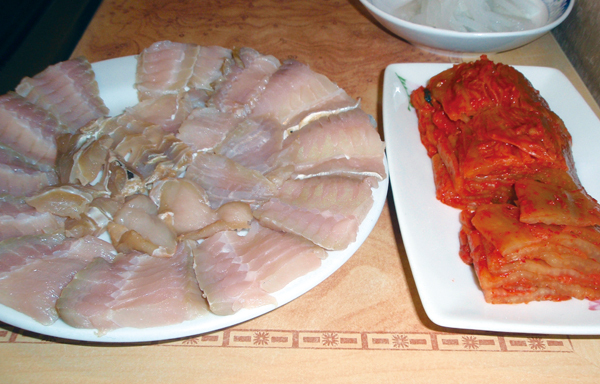 For 40,000 won, a large collection of samhap [fermented skate and steamed pork with kimchi] is offered. Eaten alone, raw hong-eo is repugnant, yet the triple-decker, bite-sized samhap is rather tasty; some would say it is strangely addictive. While the pork fat provides a bit of sweetness, the kimchi neutralizes hong-eo’s magical properties, which are most intense when one bites into the cartilage. Two parts to one serving of skate was ideal here. Selective parts can be dipped into a dried red pepper and salt mix. A fourth element, makgeolli, turns samhap into hongtak. However, some sort of beverage is needed to continually dilute the skate’s rancid bite. The restaurant event soon turned comical for owner Kim Jeong Rim, who has been at the helm for 15 years and also lives at the restaurant. She informed us that Mondays and Tuesdays are the busiest nights. However, a group of seven young Korean men didn’t last more than 25 minutes, alternately wafting their servings, plugging their noses, cringing, laughing, and ultimately leaving after passing up a once-in-a-lifetime moment. After hongtak, the cooked hong-eo soup (10,000 won) demands a soju accompaniment. A group of three 40-something Koreans invited us to their table, and then we were in a deep philosophical hong-eo discussion. We, the world, should love hong-eo, was the considered opinion. “Acquired taste,” was the collective response for the flat fish shaped like a kite. Exhibit A left me puzzled, and extremely full, yet happy. Thursday night’s Exhibit B was extra special. Donam Buchon Sikdang’s owner Mun Jin Ok immediately brought out a serving of hong-eo ekgiseu. To accompany the dish, there appeared a red liquid in a soju shot glass. I inquired and was told that this was not blood, but rather the water of hong-eo. Skate juice, the last collection of liquid before cutting the fish. Mun advised not to drink right away. Eat first. It’s good for asthma, cough, or throat ailments. As my friend picked up the serving, the olfactory assault jerked her head back immediately. No amount of coaxing worked. I was solo on this venture. I waited 30 minutes into dinner. One innocent swig. Vitriolic, disdainful, contemptuous. It coated the throat and stayed for hours. I have this old, encrusted 1970’s labeled plastic bottle of ammonia tucked in the bottom of my cabin’s cleaning closet back in the States. I would have been better off being down-and-out, turning that cap, tilting the cleaning agent upward and swallowing a shot. The verdict? Skate juice never, never, never. I asked and I received – and waited 24 hours to eat once more. Certainly pass on the ekgiseu. However, the samhap (43,000 won) is, once again, incredible. The pork is not boiled but grilled at the table. It is perfectly proportioned and palatable for a 1-to-1-to-1 ratio of hong-eo, kimchi and pork. A pepper-vinegar mix was utilized for dipping. A cider beverage cut any remaining sting away. Mun is a master at explaining the intricacies of his craft. “Hong-eo is the only thing that matures by itself without salt or sugar in our country,” he said. “Most restaurants use skate from other countries [like Chile] and it is frozen for a year. If hong-eo is from Korea, the color is pink. If it’s not, it’s lighter.” He added that his hong-eo is matured for two months at a low temperature, while the kimchi is two years old. As for the soup, “it gets stronger as it cooks.” It is a must, according to Mun, to add the broth little by little to the metal bowl of rice. Further, Mun claims that partaking in and consuming the hong-eo’s fermentation process has a better effect, 100 times over, than eating fermented yogurt. Mun came to Jeju via his father’s hometown, Heuksan Island, a Yellow Sea isle far off the coast of Mokpo. Historically, it took a long time for the island's fishermen to transport their catch – today reputed to be the best in the nation and where Mun acquires his for the restaurant – to the mainland, and the fish would spoil. And that’s how hong-eo, albeit accidentally, was discovered. The taste captivated. Being rather expensive, cheap pork and kimchi supplemented it to make a full meal. Makgeolli, or any drink, adds another dimension. The bubbly soup at both restaurants is a bit too much to handle. Exhibit B also serves a less-strong soup, cheonggukjang. Both soups are priced at 6,000 won. Again I felt gluttonously full and happy at Exhibit B. So the final question must be asked, should I go?